John Delaney has stepped down as the CEO of the FAI - to take up a new role as the Executive Vice President. The FAI released a statement this evening to confirm the dramatic change after strong speculation throughout the day regarding Delaney's position. The news comes one week after it emerged that he had paid €100,000 to the association in the form of a bridging loan back in 2017. However, the FAI statement said that the changes were a consequence of a governance review that was commissioned in February and undertaken by sports governance expert Jonathan Hall Associates, and their principal Jonathan Hall, who is a former Director of Governance and Director of Football Services with the English FA. The FAI admitted last weekend that it received a €100,000 loan from Delaney in April 2017 to ease cash flow problems. The transaction was not mentioned in the audited accounts for 2017 with the FAI saying that they had "a short-term cash flow issue". Sport Ireland, the statutory authority which is responsible for the distribution of State funding to Irish sporting bodies, then requested 'urgent clarification' on the loan. The FAI's Chief Operating Officer Rea Walshe has been appointed as the interim CEO. Delaney was approached by journalists before the game but refused to answer questions on ongoing developments. FAI President Donal Conway was asked if he gave the CEO his full backing but he declined to answer any queries and told the media pack to go and watch the match. Yet it subsequently emerged that an FAI statement was being prepared. The lengthy missive outlined the recommendations made by Hall. 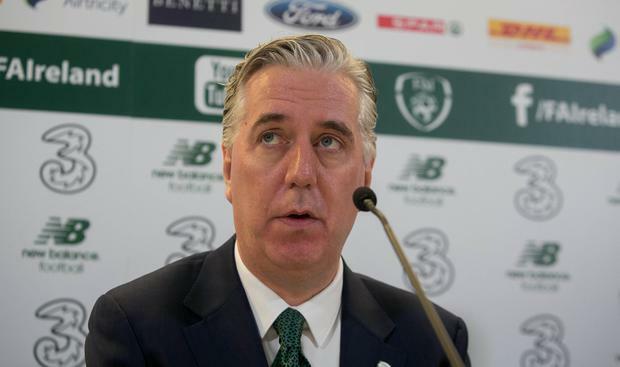 It said: "The report recommends that the FAI considers creating a new role of Executive Vice-President and starts the process of appointing a new Chief Executive Officer in order to put itself in the best position possible for the strategic period ahead. The report adds: "A new Chief Executive should be recruited to be responsible for all the other issues typically overseen by a Chief Executive of a national association. The new Chief Executive would assume responsibility for leading and managing the executive team at the FAI with appropriate executive support being provided to the Executive Vice-President to carry out the role. Both roles should be clearly defined and would report into the Board. "The new Chief Executive and the Executive Vice-President would need to work closely together in a collaborative manner in line with the updated strategy established by the new Chief Executive and agreed by the Board." "Under the new procedures, the Executive Vice-President and the CEO would attend Board meetings of the FAI but would not be members of the Board." The FAI say the review was adopted unanimously at a board meeting of the association held yesterday. "On behalf of the Board and the members of the Association I want to thank John for everything he has done for the FAI and for Irish football. He has transformed how we operate as an Association. "This new role will allow John to utilise his vast experience and connections in the world of football and will best serve the FAI as we look to the future and our new strategic plan for Irish football which is currently a work in progress." "John will continue to represent us at UEFA level as we look ahead to next year when the Aviva Stadium will host four games at the EURO 2020 finals thanks to his influence at European level." Conway also referenced Delaney's role in the bid for the 2030 World Cup. "I am very proud of my work as CEO with the FAI. Since I took up the office we have improved how we operate as an Association. "We have gone from 40 to over 200 employees in that time. We have moved to the National Sports Campus in Abbotstown and we have worked with Sport Ireland on developing world class facilities there. "Just last week, our senior international team trained on the pitches at the FAI National Training Centre alongside our Under-21 and our Under-17 teams, as they prepare for their respective European Championships."